101.3 KGOT live broadcasting from Alaska. 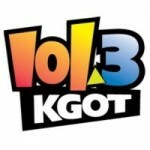 101.3 KGOT is all about hit songs of different genres from different countries. It plays different types of hit songs featuring Classic, Rock.